But I digress. Mac and cheese and me were buds. I learned how to make it from scratch and it was even better than the box stuff. Could not get enough of it. Then I changed my eating habits and eliminated gluten to help reduce my carb intake. I’m not exactly looking for ways to replace wheat flour with alternatives, but when it’s cold outside I just need some good old comfort food. Since giving up gluten over a year ago, this was my first attempt at making gluten free Mac and Cheese from scratch. I learned a few things too, mostly that potato flour is too strong. Or rather, I need less of it in my life when making béchamel. I accidentally made a nice thick batch of mashed potatoes for a minute there. It would probably be better to try making it with amaranth or corn starch, but I had this potato flour I’ve been wanting to try. The final product came out really good, but I had to do some severe on-the-fly adjusting. I just realized that all I’ve talked about is only one part of dinner. Archaellys asked for boneless Buffalo wings, so I made it with some cut up chicken breasts. They were so good, we forgot to have them dipped in ranch dressing. Seriously, I think I’ll go this route more often than actually making wings now, even though I was totally making fun of him for wanting boneless wings. Dinner was rounded out with some simple steamed broccoli. Pre-heat your oven to 350 deg F. Cook your macaroni according to the package directions and drain. If you’re not ready to add it to the sauce, just set the pasta aside. Meanwhile, make your sauce. Melt your butter in a saucepan and add your potato flour over low heat. Whisky constantly and cook for 2 minutes. (I’ve read that you could swap out the potato flour with 4 tablespoons of amaranth, but I’ve had trouble finding that for some reason.) Slowly whisk in the milk, add the spices, and increase the heat to medium. These measurements are approximate because I had to adjust so much. 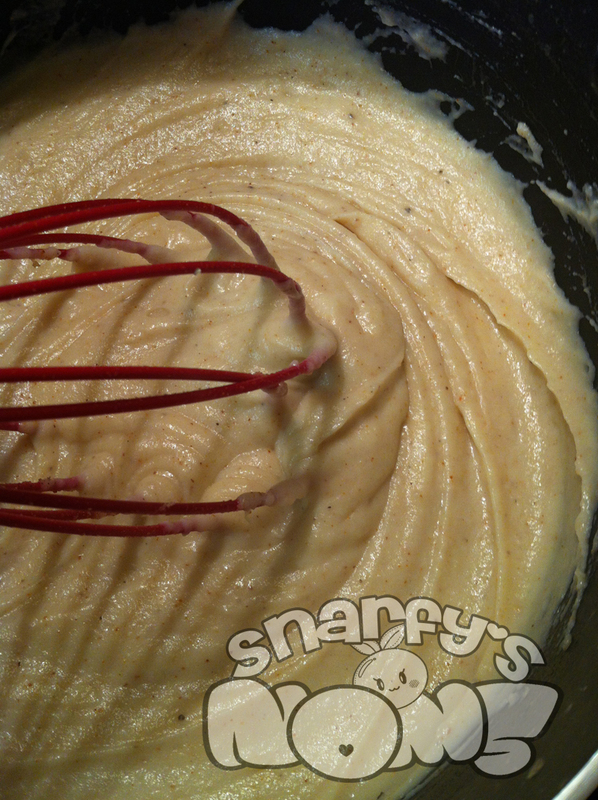 You might start with 1 tablespoon of potato flour and see what happens before adding that second one in. Once the bechamel is thickened, add the cheeses and stir to combine and melt. Stir in the pasta gently. 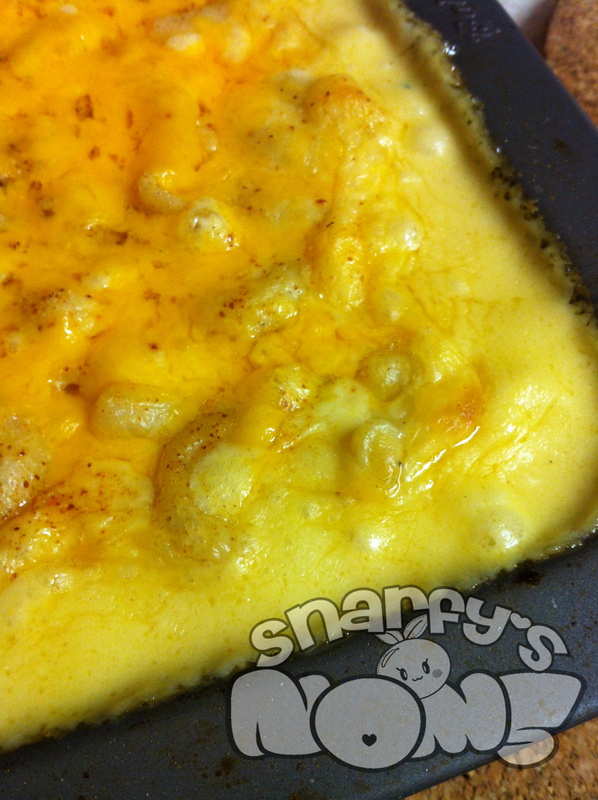 Put the mixture in a 9×12 baking dish and top with some more shredded cheese (you know you have it around). Bake for about 45 minutes and allow to cool for 5 minutes before serving. See, the béchamel was too thick so I ended up doubling the milk and removing some of it in the end. Archaellys is saving that potato-based white sauce to jazz up some mashed potatoes that he’s planning on making tomorrow, so at least it didn’t go to waste. I’ll have to test it, but I think better proportions are 1 tablespoon potato flour to 2 cups milk. Now, of course, I was too excited about Mac and Cheese to get a proper picture of the Buffalo Chicken Bites before we scarfed them all. 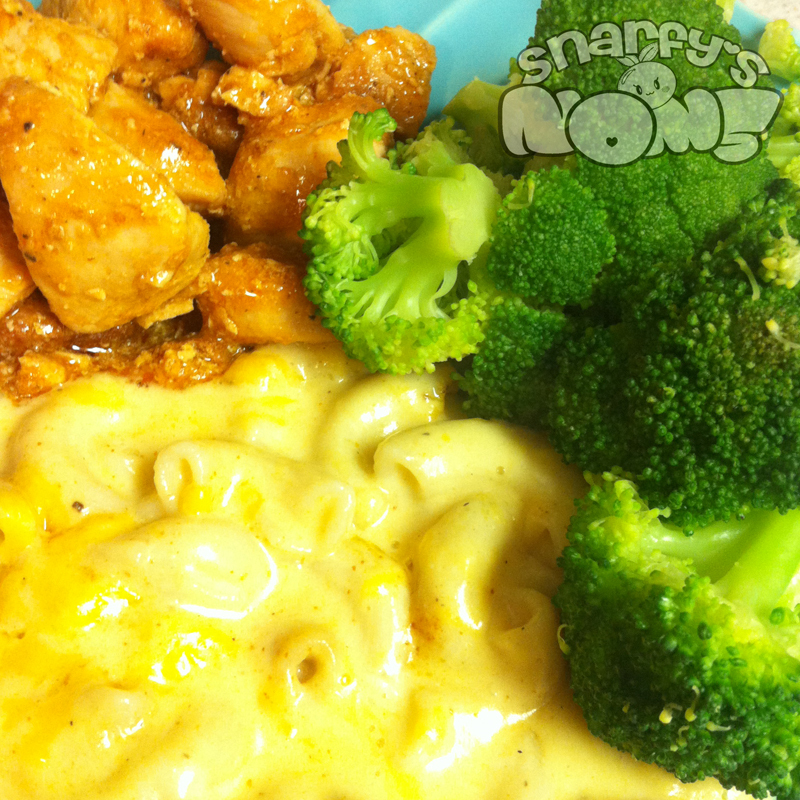 Go ahead and scroll back up to the top and look at the pretty plated pic of this dinner. This is the stuff on the upper left quadrant of the plate. Oh yes. Go look, the recipe will be right here waiting for you. Get a pan over medium-high heat and add a little cooking oil of your choice. Throw in that garlic and when it’s fragrant, add the chicken. Season your chicken to your liking, but I keep it light in this case because of the sauce. 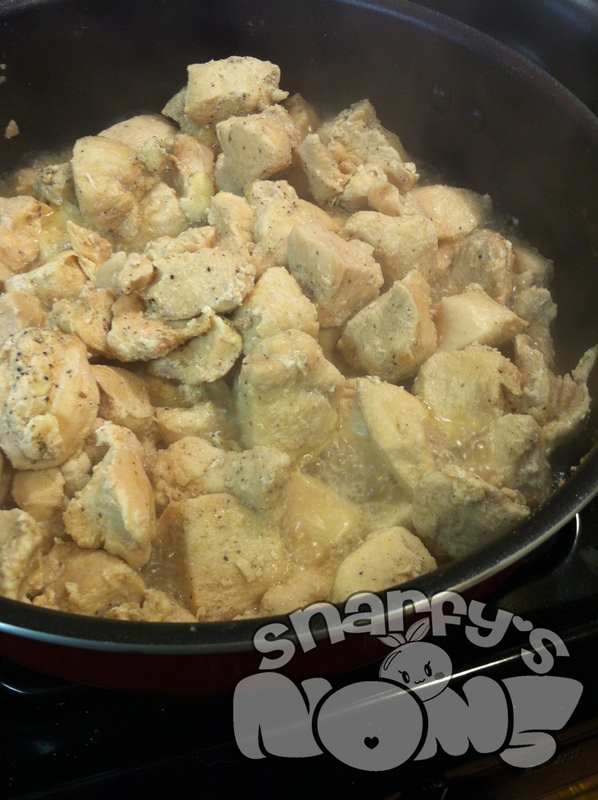 If the chicken puts out a lot of juice when you’re cooking it, just keep going until the juice cooks off. Add in that butter and once it’s all melted, add in your hot sauce. I’m suggesting at least a half cup of hot sauce, but I’ll let you decide. I really like hot sauce. Alternatively, you could melt the butter in a separate container and properly mix in your hot sauce, but who wants to dirty another dish? Not me. Oh, I guess I did get a pic of the chicken cooking. But that’s it. The chicken was tooooo good. See what I mean about juicy tender chicken? Yeah, just cook that off.